Affordable, High Quality Vinyl and Wood Windows and Doors at Factory Direct Prices! Heating bills can drop by $25 to $50 per month when you replace old windows with new energy efficient ones. Call Karl today for your free in-house estimate. Start saving now! 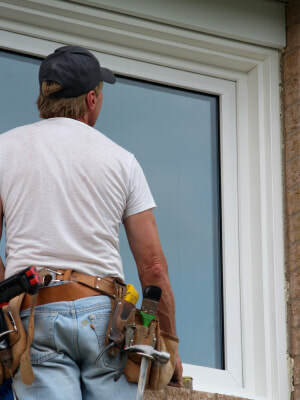 The professionals at ​Affordable Window Solutions bring over 40 years of combined experience in the sales and installation of quality windows and doors to your project. Our carefully selected products allow us to beat the high prices being charged by the large, national and regional window companies. Servicing Bainbridge Island, Kitsap, King, Pierce, and Mason Counties, and the greater Seattle area since 1996. ​Affordable Window Solutions services Bainbridge Island, Kitsap County and the greater Seattle Area. Owner Karl Buchmeier brings over 30 years of hands on experience to every window replacement job he bids. Karl and his seasoned window replacement team will meet with you in person at a time that’s convenient for you. After listening to you and surveying your home we can help you determine which window best suits your needs. After a quick measure of the windows you want to replace, we will prepare a firm bid for the job and have it delivered within 24 hours. Just high quality windows and doors at affordable prices. That's our solution. ​"Two and a half years ago we got 8 large windows and two sliding glass patio doors, one a 6 footer and one an 8 footer. The eight foot door replaced an eight foot window. Their finish carpentry work was excellent, the windows and doors absolutely gorgeous, they were clean, efficient and left my home absolutely clean afterwards. They were prompt and I would give them an unqualified recommendation. We got the large grids inserted in the windows and it has created a real “charm” to our home. In addition we had one patio door created with a medium size dog door. Our pets love it, it works well, and doesn’t leak a lot of air. We are constantly receiving compliments on the look of our windows. The energy savings has been fantastic and our home is no longer drafty. I have no relationship with Affordable Windows other than a very satisfied customer who got fabulous windows at a very reasonable price. We had four bids for the work and Affordable Windows came in at a very substantial savings. I don’t receive anything from the company for this endorsement." "We are constantly receiving compliments on the look of our windows. The energy savings has been fantastic and our home is no longer drafty." ​We provide fast, professional, installation of your new windows, with a 100% satisfaction guarantee. We’re confident you’ll be completely satisfied with the installation and quality of your new windows. 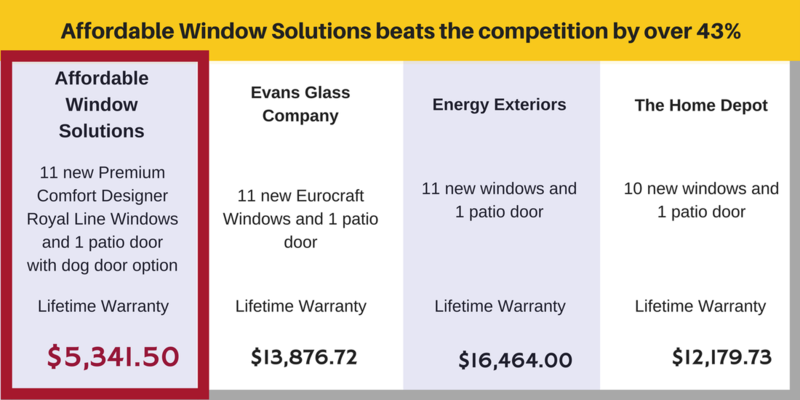 ​Our customers have saved up to 43% on their heating and cooling costs with our energy efficient replacement windows and doors.